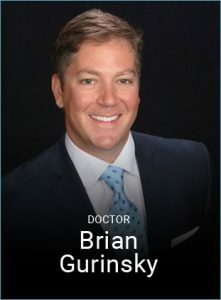 Originally from Dallas, Texas, Dr. Gurinsky attended the University of Texas at Austin and then received his Doctorate of Dental Surgery from Baylor College of Dentistry in Dallas. Upon graduation, he went straight into a three-year residency focusing on Periodontics and Dental Implants. He achieved his certificate and mastersin Periodontics, from The University of Texas Health Science Center in San Antonio. He currently maintains a full time private practice in the Denver and Centennial areas. Dr. Gurinsky continues to be inspired by the ever-changing technology within dentistry. He is a published researcher and his findings can be found in numerous papers and presentations. Some of his past research has included looking at dental implants in smokers (sponsored by Astra Tech) and enamel matrix derivative in grafting periodontal defects. He is currently researching using the human umbilical cord and amniotic tissue for hard and soft tissue grating. Dr. Gurinsky is also on the editorial advisory board for two dental journals, along with being a product evaluator. He lectures throughout the United States and Canada and teaches courses on bone grafting and soft tissue grafting. Dr. Gurinsky has been named a 5280 Top Dentist every year since 2011. He is currently serving on the Metropolitan Denver Dental Society executive board as President along with being a consultant for the Colorado State Board of Dental Examiners. In the past, he was the President of the Rocky Mountain Society of Periodontists.